Whether you're visiting the Metroplex with your family or live in the Dallas-Fort Worth area, there are plenty of spots for your kids to meet the Easter Bunny in March and April. From Easter egg hunts to special events at DFW's biggest attractions, don't miss your chance to get a photo of your kids with the furry mascot of the season. While costumed Easter bunnies are rare in Dallas-Fort Worth, there are still plenty of places to get a portrait of your children taken with a live rabbit instead. There are also several great photography studios in the Metroplex that offer Easter specials. Although most of the Easter-themed events are free, getting a photo with the Easter Bunny or a live rabbit will cost extra. Every year, spring flowers bring the Dallas Blooms event to the Dallas Arboretum, and as part of the celebration, the gardens host a number of Easter activities as well. Weekend events kick off on Good Friday with the Eddie Coker Concerts on the Martin Rutchik Concert Stage and Lawn at 11 a.m. and 2 p.m.
On Friday through Sunday from 12 to 4 p.m., family portraits are available by Ivey Photography with a live bunny at the Wishing Well, and on Saturday and Sunday, enjoy live music, games, face painting, and an Egg-streme Scavenger at the Hunt Camp House Lawn from 11 a.m. to 3 p.m. Guests are encouraged to use the convenient shuttle at Gaston/Garland that will drop them at the Arboretum's front door. 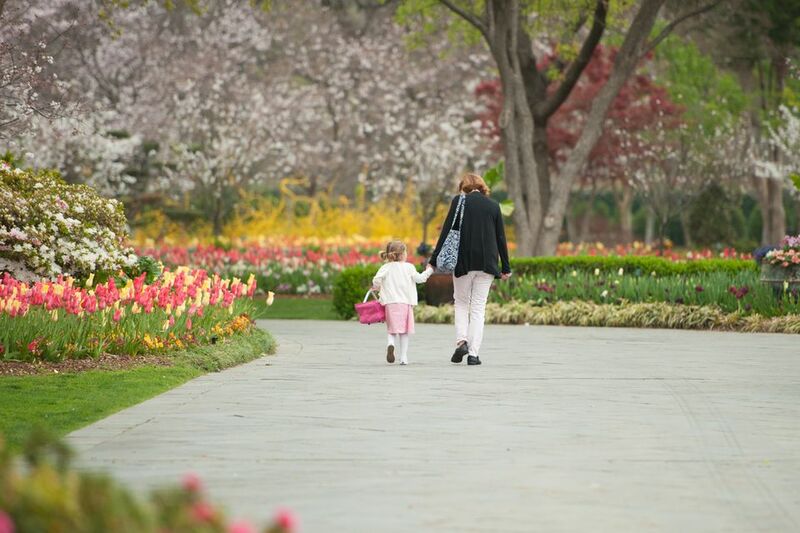 The Dallas Arboretum is open from 9 a.m. to 5 p.m. daily, and Dallas Blooms runs through April 7, 2019. If you're looking for a place to get a professional portrait of your child to share with your friends and family for Easter, there are many photographers in the DFW area offering specials for Easter. At LovePicLove, kids get a 20-minute studio session with a bunny for $150.00, which includes five retouched digital images and a print. There are limited slots available, so call for a reservation. Alternatively, you could visit Marc Robins Photography at Northpark Center in Dallas, which hosts "Bunny Rabbit Days" from March 27 to April 20, where you can get portraits of your kids cuddling alongside live bunnies (with no appointment necessary) from 10 a.m. to 5:30 p.m. daily. Finally, Brandi B. Photography can photograph your children with live Easter Bunnies and spring flowers from April 1 to April 14th. The session fee is $48.00, includes one five-by-seven print, and the studio guarantees the photos will be ready by Easter. While Mr. and Mrs. Bunny used to hide eggs at the Historic Nash Farm in Grapevine, the Delaney Vineyards and Winery have since taken over the event. On April 20, 2019, the annual hunt returns with special egg prizes, a petting zoo, hay rides, face painters, bounce houses, and opportunities to get pictures of your children with Mr. and Mrs. Bunny. The event runs from 12 p.m. until 4 p.m. Hop aboard the Grapevine Vintage Railroad for Easter Bunny Train Rides on Sunday, April 21, 2019, with departures at 2:20 p.m. and 4:20 p.m. Featuring a one-hour ride on this historic rail line, sweet treats, and surprise appearances by the Easter Bunny, your kids are sure to love this special event. Plus, if they've never ridden in a train, they get to experience that for the first time, too. Ticket are $14.00 per person. On Sunday, April 14, 2019, from 4 p.m. to 5 p.m., the Hunters Glen Baptist Church will host its annual Easter festival, the Easter Hunt. Activities include an egg hunt, obstacle course, giant slide, and a scavenger hunt for school kids. The church also typically has a member dressed in an Easter bunny costume, but it's not guaranteed. Head over to the Joe Farmer Recreation Center in Allen Texas on Tuesday, April 16th from 9 a.m. to 11:30 p.m. for a $10.00 tiny tots meal for children, craft making, and storytime. It is $6.00 additional for an adult breakfast. The Easter Bunny will join kids aged six months to six years old for the special celebration, and parents can take as many pictures as they like with their kids and the Easter Bunny.